Victory brings post season honors! Amerson, Bolton, Egan, and Stanley earn first team Class 2A LSWA All-State selection. Falcon head coach Barrett Morgan named Class 2A Coach of the Year. BATON ROUGE, LA—With victory bring the spoils as the Saint Thomas Aquinas Baseball Falcon dominated the selections to the Class 2A LSWA All-State Team with four and Falcon head coach Barrett Morgan named Class 2A Coach of the Year. 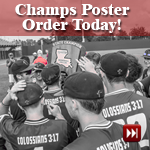 Morgan’s Falcons defeated Opelousas Catholic (7-1)and Saint Charles (3-1) at the LHSAA State Tournament to win their first title in baseball, capping a 32-3 campaign. Saint Thomas placed four players on the baseball team: pitcher Alex Egan (11-1, 1.24 ERA), catcher Ryan Amerson (.389, 30 RBIs), outfielder Reed Bolton (.421, 37 runs scored) and Hunter Stanley (.402, 29 RBIs). District rival Doyle also received a selection on this year's team as Dillon Blount earned Honorable Mention LSWA All-State honors. Falcons are the LHSAA Class 2A Champions!! It was Sophomore Saturday as some heroics by sophomores Champ Artigues and Alex Egan helped lift Saint Thomas to 3-1 victory over Saint Charles Catholic. The 2015 Falcon Football Team finished 14-1 and advanced to the LHSAA Class 2A semi-finals. They lost only two games all season. The first was one that did not count when they lost 9-6 to Saint Charles Catholic in the Jamboree. The second was a loss to Notre Dame 33-0 in the LHSAAA Class 2A semi-finals. The Falcon Baseball Team defeated both Saint Charles and Notre Dame—Saint Charles in the title game and Notre Dame in the quarterfinals. made it to the Class 2A Championship game and the top-seeded Falcons prevailed 3-1 completing a wire-to-wire season as the top ranked team. A pair of sophomores delivered the day’s heroics as Champ Artigues hit a two-run triple in the fifth to break open a tight game, and Alex Egan pitched a complete game in the Falcons 3-1 win over the Comets at McMurry Park in Sulfur, Louisiana. For Saint Thomas head coach Barrett Morgan the victory was extra sweet as he was able to lead his alma mater to the title while compiling a 32-3 record along the way. The Falcons reached the semi-finals for the first time in baseball when the 2009 club defeated Many 11-3 to advance to the final four, but lost to Sterlington 7-2 in the semi-final contest. Seven years later Coach Barrett Morgan wearing the number seven on his jersey took a Falcon team with seven seniors to the Class 2A Championships winning the semi-final game 7-1 and the championship game 3-1. The key hit that put the Falcons ahead for good in the championship game was delivered by Champ Artigues who wears the number one on his jersey. The final out of the State Championship game was a fly ball caught by Jacob Becerra who is 17 years old. The Falcons overall playoff record this year was 7-1 with the one loss coming at the hands of Notre Dame who defeated Saint Thomas 7-3 in the first game of their three-game series. Sophomore Alex Egan struck out seven batters in his complete game victory in the State Championship win over. Saint Charles Catholic. The Falcons defeated Doyle 7-0 on Senior Night to secure a perfect 9-0 record in District play. The Falcons hit only one home run during the pre-season and regular season. In the very first at bat to start the Mandeville Jamboree, senior Reed Bolton hit a lead-off home run and junior Trey Milazzo smacked a two run dinger against Loranger. The number one is only divisible by itself. It is independent of any other numerals yet composes them all. It symbolizes in the Bible the unity and primacy, and the oneness of the Godhead. The 2016 Falcons are indeed ONE, united and often refer to each other as brothers. The number seven is used 735 times in the Bible and is the number of completeness and perfection. The 2016 Baseball Falcons were not the most physically gifted team on paper but complete in every way fitting perfectly together so as to be able to defeat a host of more talented teams. 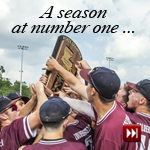 The 2016 championship was the first baseball state title in Saint Thomas sports history and the 25th overall state title won by the school’s sports teams. an error. Two batters later, Lloyd Nash drove home DuBose and advanced to second on a throw home and to third on a bunt single by Dane Authement to put runners on the corners with one out. But Nash was thrown out at home after a grounder back to Egan for the second out, and Justin Ory popped out to second to end the inning. “It would have been easy to let the game go in this spot, but again I am so proud of the guys for putting their foot down and saying ‘NO, you are not getting anymore runs’, and then they guys came right back in the bottom half and got the run back to tie it and That was a turning point for us in the game,” continued Morgan. Saint Thomas rallied in the bottom half of the third as Kyle King singled with one out and scored on an RBI fielder’s choice by senior Hunter Stanley. The Falcons then took control for good in the bottom of the fifth. With one out, King reached on an error by second baseman Zack Weber, who had trouble fielding a hard-hit grounder. Reed Bolton was then hit by a pitch to set up Artigues’ heroics. Egan allowed just four hits and struck out seven. The sophomore right-hander played it close to the vest and the scouting report, inducing eight fly outs by second-seeded St. Charles. His performance earned him the LHSAA Most Valuable Player Award voted on by the Media. Brennan Gilberti of St. Charles also was impressive, allowing just five hits and striking out two in the game. Along with Artigues’ two-RBI triple, senior Hunter Stanley smacked an RBI double, while sophomore Michael Dickson added a double, junior Kyle King had a single and scored twice, and senior Reed Bolton hit a single and scored a run. The loss to the Falcons marked the sixth time Saint Charles has finished as a state runner-up. Falcons headed to Class 2A State Tournament today. Saint Thomas to play the Opelousas Catholic Vikings at noon Friday. The game will be broadcast live on Tangi965.com and Tangi 96.5. 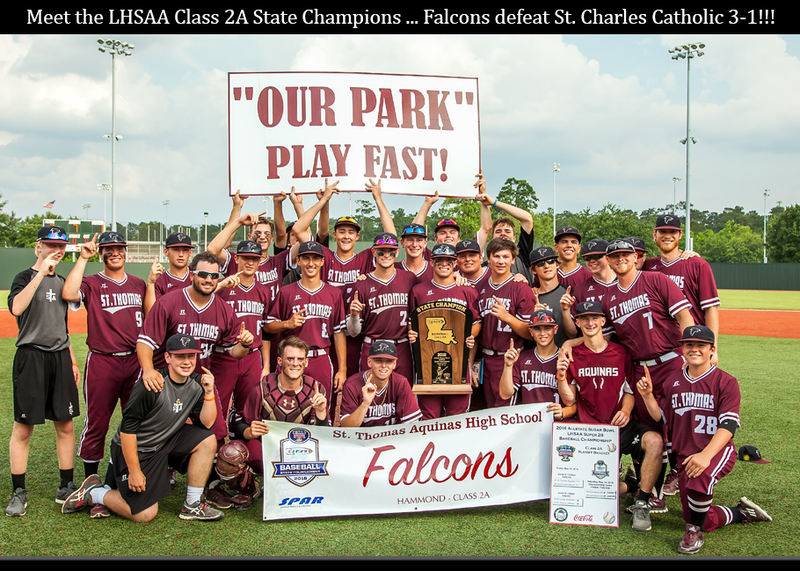 HAMMOND—With a two-game rally last Saturday to win the LHSAA Class 2A Quarterfinal best of three series over Notre Dame, the Falcons became only the second team in school history to advance to the final four of the State Baseball Playoffs. They join the 2009 team that were the first. The Falcons will play the Opelousas Catholic Vikings at high noon on Friday at McMurry Park, Sulphur, LA. The Vikings Episcopal 2-0 to advance. The Falcons have collected an impressive 30-3 record so far, while the Vikings own a 28-7 mark, but records only tell us about the past and can’t predict the future. Saint Thomas will meet a team that plays a similar style relying on defense and steady pitching. “They are solid in all aspects of the game and while no one plays exactly like we do, they are similar to us in style,” said Saint Thomas head coach Barrett Morgan. The winner of the Falcon’s game with the Vikings will face the winner of the contest between district rivals Riverside Academy and Saint Charles Catholic for the Class 2A State Title. The Falcons have set several records this season posting one of the best starts and winning more games in a season than any other team in their history, but there are still a pair of blank pages unwritten in this year’s history book. The 2009 Falcons were eliminated in the semi-finals. The 2016 Falcons will have an opportunity take their turn on Friday to see if they can make more history with a win and advance to the Championship Game. The pages lay bare and the ink is wet, but it will be how the Falcons play that will determine what is written and if a second page remains blank. Falcons break into the MaxPreps Small Schools Baseball National Top Ten. Saint Thomas earns number nine national ranking from MaxPreps. CBS SPORTS DIGITAL—The Saint Thomas Aquinas Falcons earned some notice this past week as they were ranked ninth in MaxPreps Small Schools Baseball Top Ten annual national rankings. The honor was posted prior to the recent playoff with Notre Dame. The Falcons stayed atop the LHSAA Class 2A Power Ranking for the entire regular season. The MaxPreps Top Ten Small Schools include: 1. (last time 2) Verdigris (Claremore, Okla.), 27-2, 22.6, 2. (NR) Lafayette Central Catholic (Ind. ), 20-0, 20.8, 3. (5) Harding Academy (Searcy, Ark. ), 28-3, 20.6, 4. (NR) Red Oak (Okla.), 19-6, 20.0, 5. (NR) Central Heights (Nacogdoches, Texas), 19-1, 19.9, 6. (21) American Christian Academy (Tuscaloosa, Ala.), 22-3, 19.8, 7. (1) West (Texas), 20-4, 19.7, 8. (17) Canterbury (Fort Myers, Fla.), 29-1, 19.4. 9. (6) St. Thomas Aquinas (Hammond, La. ), 28-2, 19.4, and 10. (9) Hebron Christian Academy (Dacula, Ga.), 26-5, 19.1. The small school rankings are based on the MaxPreps Computer Rankings presented by the Army National Guard. Small schools are those that play in state enrollment divisions that generally have fewer than 1,000 students. Falcons rally to win Quarterfinal Series over Notre Dame 2-1. Top-seeded Saint Thomas overcomes first game loss on Friday with a pair of wins on Saturday to punch ticket to Final Four. HAMMOND—The 8th-seeded Notre Dame Pioneers thought they had the top-seeded Falcons right where they wanted them with a 7-3 win on Friday to take 1-0 lead in the best of three series, but Saint Thomas had other ideas as they rallied on Saturday with a pair of wins to secure the series 2-1. The Falcons evened the series with a 5-3 win and then clinch it with an 8-2 win earning a ticket to the final four show next weekend at McMurry Park in Sulphur, Louisiana. The Falcons will play the Opelousas Catholic Vikings (28-7) who swept Episcopal 2-0 to advance May 13 at 12 noon. The Vikings played Notre Dame three times during the regular season losing their first two meetings and winning the third. It has been seven years since Saint Thomas sent a baseball team to the Class 2A LHSAA Final Four Championships. The 2009 team was the first and only to reach the semi-finals in Saint Thomas history until this year’s squad became the second. The Falcons are currently boast a 5-1 playoff record this season, while the Vikings are a perfect 5-0 having swept both series following a first round win. Sixth-seeded Riverside Rebels (24-10) and second-seeded Saint Charles Catholic Comets (28-8) are the other two semi-finalists and will play May 13 at 1:00 p.m. The Rebels and Comets split a pair of one-run victories in the regular season with Comets winning the first meeting 7-6 and the Rebels the second 1-0. Saint Charles Catholic posted a 10-4 mark against 5A and 4A competition this season, while the Rebels collected a 7-6 mark. Falcons to host Notre Dame in Quarterfinals. 8th-seeded Pioneers sweep Kinder to advance. HAMMOND—The Saint Thomas Aquinas Falcons will host the Notre Dame Pioneers this week in the third round of the LHSAA Class 2A Playoffs. The Pioneers (20-13-1) swept Kinder to advance winning by scores of 6-5 and 12-6. Kinder defeated the Falcons last season 7-5 in the Quarterfinals. Saint Thomas will play for a chance to be the second team in school history to advance to the semi-finals. The 2009 team was the first. Falcons sweep their way into the LHSAA Class 2A Quarterfinals! Saint Thomas Baseball sets record for most wins in a season with 28. HAMMOND—The Saint Thomas Aquinas Falcons swept their way into the LHSAA Class 2A State Quarterfinals Saturday with a five inning ten-run rule win over the visiting DeQuincy Tigers. It was the second shutout over the Tigers in as many days and gave the Falcons a 2-0 sweep in the best of two out of three series. The win was the 28th on the year for the Falcons setting a new record for the most wins by any baseball team in Saint Thomas history. The Falcons will host the winner of Kinder and Notre Dame next week. Hunter Stanley worked all five innings on the bump pitching a shutout, scattering three hits, and ringing up six. The Falcons helped their right-handed senior starter by plating four runs in the top of the first. A groundout by Alex Egan, an RBI double by Ryan Amerson, and a two-run double by Brett Bass in the first inning supplied the early offense. The game was decided quickly as the Falcons exerted its will early with seven runs in the first three innings. Saint Thomas increased its lead with three runs in the third as Michael Dickson doubled, plating Donny Roberts and Egan to start the inning. Senior Ryan Amerson racked up three RBIs on two hits for the winners. The Falcons were most efficient at the circle making the most of just seven hits to collect 10 RBIs. Of the seven hits five were doubles. Along with Amerson’s three RBIs, junior Kyle King, Bass and Dickson all had two RBIs. Sophomores Alex Egan and Champ Artigues each had a hit and scored a, and senior Reed Bolton stole a base and scored a run and junior Donny Roberts scored twice for Saint Thomas. Egan masterful in 5-0 shutout of the DeQuincy Tigers! Sophomore Alex Egan fans nine and scatters three hits as Falcons take game one of the three game series. Game two set for 11:00 a.m. Saturday. HAMMOND—An exceptional effort by Alex Egan hoisted the Falcons to a 5-0 win in seven innings over DeQuincy (LA) on Friday. The sophomore right-hander kept DeQuincy off the scoreboard for all seven innings he was on the hill. He pitched a shutout, allowing no runs on three hits while striking out nine. Saint Thomas got theris bats going early, scoring three runs in the first inning to pull ahead of the Tigers. The Falcons scored in the first on a two-run double by Hunter Stanley and an error. Saint Thomas added some insurance in the fourth scoring on an RBI single by Michael Dickson, plating Brett Bass and Champ Artigues scored in the sixth on an error. In total, the Falcons collected eight hits as Artigues led with a pair and Stanley made the most of one plating two RBIs. Dickson added an RBI single for the winners, while Bass had a single and scored twice. Egan helped himself at the plate with a single and Bolton had a single and scored a run. DeQuincy advances with 3-0 win over Thomas Jefferson to earn right to take on the Falcons. Saint Thomas to face another squad of Tigers in DeQuincy after defeating the Loreauville Tigers 7-4 to advance to the Regional Round. District friend and rival Doyle upsets Hannan 14-4 to advance. Game One Friday 5:30 p.m., Game Two 11 a.m. Saturday, and Game Three if needed TBA. HAMMOND—The Falcons will remain in the mascot jungle in the round two of the Class 2A Playoffs as they face another squad of Tigers as DeQuincy advanced to play Saint Thomas with a 3-0 win over Thomas Jefferson. With the new format change for rounds two and three the Falcons and Tigers will play a best two out of three and Saint Thomas as the higher seed will host all the games. The Tigers of DeQuincy finished the season with a 15-9 record and were the runner-up in District 4-2A with a 6-4 mark which includes 9th-seeded Kinder, the District Champion, 27th-seeded Manu who lost to Menard in round one, and 30th-seed Welsh, who lost of Episcopal in round one. Falcon post 7-0 lead but have to hold off Tiger rally for win. Saint Thomas defeats Loreauville 7-4 to advance to the Regional Round. HAMMOND—The Falcons used a first inning offensive ambush and some solid defense to advance to the second round of the LHSAA Class 2A playoffs with a 7-4 victory over the Loreauville Tigers in action Monday at Austin Brooks. Saint Thomas plated six runs in the bottom of the first and took a commanding 7-0 advantage into the top of the seventh but had to hold off a Tiger rally that produced four runs with one out before the Falcons finally closed it out with a diving catch by second-sacker freshman Bryce Jones and a pop-up caught by senior Brett Bass. Top-seeded Saint Thomas to host the Loreauville Tigers in round one of the LHSAA Class 2A State Playoffs. HAMMOND—As the number one seed in the LHSAA Class 2A Tournament Saint Thomas Aquinas Falcons will spend the second season at home through the quarterfinals if they continue to win. The Falcons will open the playoffs Monday when they host the Loreauville Tigers at 5:30 p.m. at Austin Brooks Field. The Tigers enter the playoffs as the 32nd-seed with an 11-11-1 record and winner of District 2-6A. The first round of the playoffs is a one-and-done contest, but the second and third rounds are a best of two out of three series. The semi-finals and finals return to a one game playoff and will be held May 12 - 14 at McMurry Park in Sulphur, LA. The Tigers won their District with a 7-1 mark and posted quality wins over 5th-ranked Class 1A Hanson Memorial and 18th-ranked Sacred Heart and led 5th-ranked Class 4A Breaux Bridge for six innings before Breaux Bridge rallied for three runs in the bottom of the seventh to escape with a 6-4 win. The higher seed will remain at home in this year's tournament. HAMMOND—It has been a year of “firsts” for the Saint Thomas Aquinas Baseball Falcons. Mostly they have spent the entire season in first place atop the LHSAA Class 2A Power Rankings, posted the highest winning percentage (.926) in their history at 25-2, and remained in first place in District play wire-to-wire finishing with a perfect 9-0 mark. Monday at 5:30 p.m. they will take the field at Austin Brooks as the number one seed in the Class 2A Tournament when they host Loreauville (11-11-1, 7-1) in round one of the playoffs. It was far from love at first sight when Morgan arrived on the Saint Thomas campus as the new head baseball coach almost two years ago. Despite being a 2004 graduate of Saint Thomas who lettered in baseball four years and twice earned LSWA All-State honors and eventually becoming an assistant at Southeastern, the Falcon players were not too sure about their fiery new coach when they first met to play summer ball. Every team is different thus, comparisons are often inaccurate and don’t consider the times in which they played. However, with the success of this year’s team there are whispers about the 2009 Falcons, who reached the semi-finals and so far the only Saint Thomas baseball team to do so. The 2009 and 2016 teams both enjoyed success but in many ways could not be more different. They succeeded using different styles. The 2009 squad averaged eight to ten runs a game and relied on power at the plate, while the current Falcon club wins with defense and pitching and solid base-running. The style of high school play has certainly changed for all teams in recent years with the changing of the bats thus, forcing coaches to focus more on defense and the short game to manufacture runs. Often one learns more from failures than successes and that could not be truer looking at the Falcons only two losses of the regular season. Having started the season on a 14-game winning streak, the Falcons saw their first defeat come at the hands of a pesky Maurepas team with a 2-9 mark at the time they played. The Wolves limited Saint Thomas to just three hits and won 3-1. Baseball can be a humbling game and yesterday’s successes don’t count towards today’s game. The Falcons only other loss came on the road against 5th-ranked Class 5-A Jesuit. Saint Thomas gave the Blue Jays all they could handle for five innings before yielding a pair of runs in the sixth as Jesuit escaped with the 2-0 win. The Falcons demonstrated once again they could match up and go toe to toe with elite teams as they finished this season with an 8-1 mark against 4A and 5A clubs. If the Falcons are to make a successful playoff run, they will rely on a solid defense that boasts a .989 team fielding percentage and a team ERA of 1.423. Senior Hunter Stanley leads the Saint Thomas pitching staff with an 8-0 mark and a .549 ERA, while sophomore Alex Egan is right behind Stanley boasting an 8-1 mark and a 1.481 ERA. Junior Trey Milazzo and senior Trey Tallia round out the starting staff with Milazzo posting a 5-0 Mark and Tallia a 3-1 record on the bump. At the plate Saint Thomas finished the regular season with a team batting average of .348 and an on base percentage of .452. The Falcons have collected 81 stolen bases with a .827 success rate. Five Falcon starters are batting over .400 and Saint Thomas has made the most of 249 hits averaging seven runs a game with only one home run on the year. The LHSAA playoffs is a one and done format so no smart team looks any further than the team they are going to play. But if one would let their mind wander and think ahead, the Falcons have some unfinished business from last season. Unlike the 2009 team that defeated Many 11-3 to reach the final four, the Falcons lost to Kinder, the eventual state champions, 7-5 in the quarterfinals last year. Except for two seniors that graduated, the players that got a taste of getting close to punching their ticket to the big dance but were disappointed are back again this year with a renewed determination. Bleakley ... Perfect Game Winner.